int(2) 'mastic' in medieval crossbow decoration - what is it? 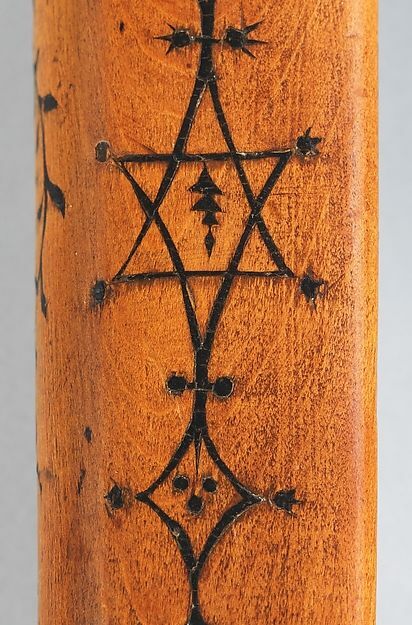 'mastic' in medieval crossbow decoration - what is it? - impressed lines filled with 'some kind of black mastic' (Breiding, D, "the crossbow of Ulrich V"). Any ideas what the mastic was or how to replicate the finish? Re: 'mastic' in medieval crossbow decoration - what is it? Probably a tar of some sort. Pine sap with powdered charcoal? Naturally occurring bitumen with additives? I have no real experience with these products; does pine sap dry? I have only come across it indirectly when knots bleed out in construction grade timber - their resin can stay active for years. I know the Middle East was exporting petroleum-based products during the later Medieval period so bitumen could have been possible, I guess, or maybe a varnish mixed with soot/charcoal? Dried pine sap = Amber!! Yes it can dry, but a powdered additive, like charcoal or even dust hurries the process. The tiller of my Avatar bow is a piece of 125 year old Southern Yellow Pine that was cut down more than 50 years ago. It has a few sap pockets that will break teeth out of a saw blade, and the sap is diffused throughout the wood making it VERY hard to cut and work. My first though when I saw the picture was that the technique was "kolrose" carving (like scrimshaw but on wood. However those lines are too wide and deep. Still, the technique might apply. The grooves could be 'painted' with some sort of varnish, and then finely ground charcoal blown or poured into the wet lines and the varnish allowed to dry before being wiped clear. It doesn't appear to be a woodburn to my old eyes. The edges of the lines are too crisp; the points too pointy, and there's not of the 'slightly darker' color you get when the wood just outside the tool gets a bit too hot. Its been positively identified as a filler by the foremost expert on that particular crossbow, and as Ken says, its all a bit too 'crisp' in the carving for a wood-burning. Equally, I think that the penetration of the filler into very fine lines suggests quite a 'runny' filler as something more sticky wouldn't necessarily have the same ability to fill cuts that are little more than scratches. Powder over varnish would tick all the boxes, particularly as there is no penetration of the pigment into surrounding wood fibres. Read up on "kolrose" carving. 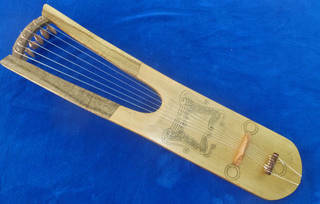 Here's some kolrose I did on a replica of a 7th century Lyre. The overall length is 34" and width is 8", The facing figures are about 5" tall, to give you an idea of the size. You lay down a layer of plain clear "varnish" to seal the wood. Then carve the design. Then powdered charcoal is dusted over the whole surface and wiped away, leaving the lines dark. A second layer of varnish seals the charcoal into the wood. I have used the technique in the past didn't know what it was called though, lovely work on the lyre btw. One of the guys on the PA forum suggested hide glue instead of varnish. I'm planning on using a combination of chip-carving knife and v-tool with a punch for the circles. If I were going to use a glue, I'd use fishbladder glue rather than hide glue. Fish glue has a much longer 'wet' time than hide glue -- but still not more than a few minutes. That kolrose is kind fun. I bought a special shape knife to do the carving -- $12 off Etsy. And I powder charcoal stick that I get from a local art supply shop. The design on the Lyre is a pair of Pictish Beasts from a Pictish Standing Stone I saw last year in Scotland. The Picts were the Stone Age inhabitants of what is now Scotland, 'way before the Scotii arrived from Ireland. No one knows what the Beast represents... all the other animals on all the known standing stones are readily identifiable. But from one end of the country to the other, they always drew the Beast the same way, with that long extension from the head and the duck-bill face. Interior lattice carving varies from Beast to Beast.